The character of the Hungarian wine depends on soil and climate of a very small area (smaller than New York City) and a variety of grape called the Furmint. The Furmint grapes are left on the vine when ripe. In most years, the unpicked, over-ripe grapes are attacked by the “noble rot” that occasionally distinguishes French and German vintages. The berries shrivel and the concentration of sugar soars. The resulting “grapes” – imagine raisins – are known as aszú. In the traditional way of making Tokaji Aszú, the hand selected aszú grapes were harvested in wooden hods called puttonos, each holding about 27 liters, and weighing 22 -25 kg full of grapes. Three to six puttonos of aszú grapes were put in a large vat and trampled by foot. Because the grapes were so dry, this formed a sort of paste or dough. Then a caskful of must or young wine is added to the vat. The cask is standardized: a gönci hordó (cask from Gönc), which holds 136 liters. The mixture is allowed to ferment for as long as 2½ days, and is then transferred to barrels for further aging. A gönci hordó added to 3 puttonos of aszú produced 3-puttonos tokay. The more puttonos in the vat the higher the quality of the resulting tokay; 6-puttonos is the highest quality labelled in puttonos. Changes in regulations and wine technology have affected the meaning of the puttonos designations. 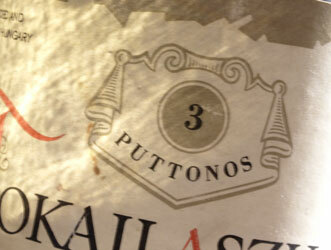 In 1945, wines could no longer be labelled 2-puttonos. Instead of counting hods, the puttonos rating is now based on the sugar content of the wine, minimums of 60, 90, 120 or 150 grams of sugar per liter corresponding to 3-, 4-, 5- or 6-puttonos wine respectively. Since 2013, only 5 and 6-puttonos wines are allowed to use the word puttonos on their labels; no more 3- or 4-.